All my heroes are fallen. 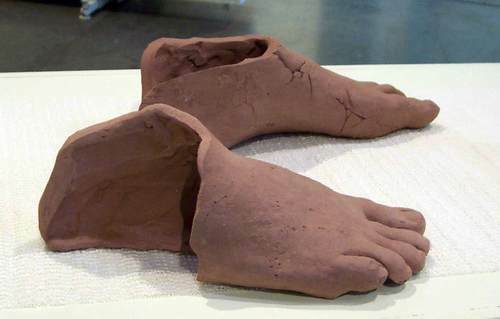 ….all my heroes have clay feet…. Pretty snappy definition for a hero, hunh? Hero ˈhi(ə)rō/ noun:- a person who appears to be that which you long to be… but don’t have the strength to become…. Turns out my “heroes” had no more strength than I did. So, I sit here with the realization that I am someone’s hero. That someone out there is looking to me as if I am the epitome of what they long to be, but lack the strength to become. Actually, the truth is I have already let them down, they just don’t know it yet… They think I’m “X” and really I’m “Y” they heard me …or saw me.. or read something I wrote and thought that was all there was to me. Eventually they will see me with my socks and shoes off… and discover that I have clay feet. I believe that true heroes are the those who show off their bare feet…. who are who they are and love without masks. Who when the socks and the shoes come off they are the same as they were when they were still in uniform. They choose not to hide and are not afraid to let people in and see them bare and exposed…. Not in a way that is proud or boastful, but in a way that is vulnerable and transparent. This isn’t easy…don’t get me wrong, this is who I long to be, but I still fear man too much. And this doesn’t make them perfect but it shows that they are human… and ordinary hurting people can relate to them. And I think when we can come to this place of Love without pretense then we can be a little bit more like Jesus (which is our goal) and lead people into the truth with an openness that will help break down barriers…. and freedom can occur … in their lives and even in ours – and to me that is the picture of a true hero… And it is the picture of the heroes in my life who have helped guide me out of darkness and into the light.